Acne treatment (naturally at home or otherwise) is the most sought after treatment among the younger generation. Acne is a common and chronic skin disorder. 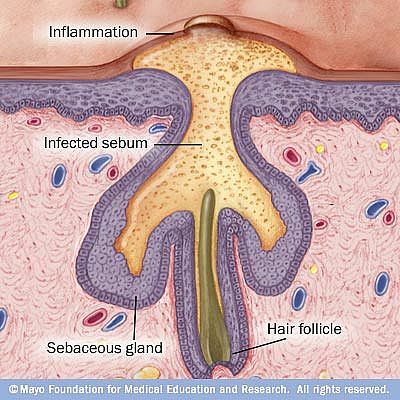 It is an inflammatory condition of the sebaceous glands and hair follicles. The lesions are usually found on the skin of the face, neck, chest and shoulders. 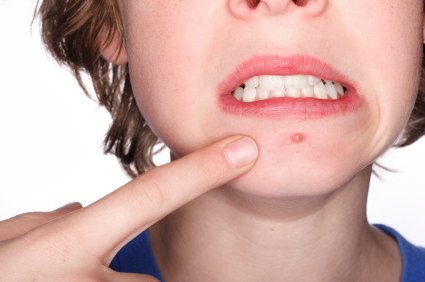 Nearly six out of ten young people between the ages of twelve and twenty-four suffer from some degree of acne. Acne at any age is embarrassing if not inconvenient and painful. Teenage acne, in particular, can be very frustrating as it occurs at an age where the individual is a lot more sensitive about his/her appearance. Read about how yoga can cure acne. Yoga poses for acne and pimples are poses that help to increase blood circulation and this ensures that your skin receives the oxygen rich blood it requires. It also induces perspiration which the body’s natural method of flushing out the pores of the skin. When this is done on a regular basis, the debris, sebum, and dead skin cells within the pores of an individual’s skin are removed and this results in fewer blockages. Home remedies for pimples and acne treatment are therefore often best used along with yoga practice. Besides acne remedies, one may also ask, what are some quick remedies for whiteheads on the nose, ears and chin? Acne vulgaris could also result in lesions and treatment for the same would involve home remedies as also medication that is recommended by your doctor. There are various types of acne that range from mild to extremely severe. Acne Vulgaris is the mildest and most common form of acne. The symptoms of this type of acne include blackheads, whiteheads, papules and pustules. 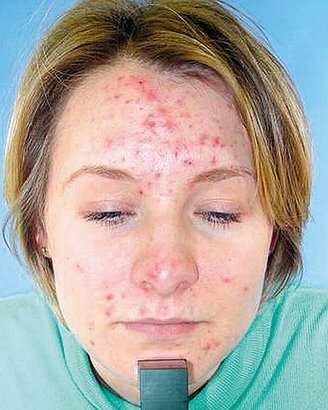 This kind of acne affects the forehead, cheeks, chin, chest as well as the back. Although mild in intensity, Acne Vulgaris can cause considerable scarring. When seeking methods on how to get rid of acne it is important that you understand the causes of the condition if any, or at least the irritants. Although we may not have a clear understanding of the causes of the different types of acne there some definite measures that can be taken. Acne is not caused by poor hygiene but poor hygiene practices could aggravate a case of acne and increase the severity of the symptoms. In addition to acne treatment, whether with pharmaceuticals or home remedies for pimples and acne, it is important to follow a regular skin care program that suits your type of skin. If you have oily skin you would need to wash your face more often than usual. Care should also be taken that the products used would be gentle and not result in increased sebum production. If you have dry skin you it is not necessary to wash your face very often. It is also important that you use products that suit your skin type. Many cosmetic treatment methods for acne could result in skin irritation and excessively dry skin. Harsh cosmetic products that are meant for oily skin can often leave the skin excessively dry and this will cause increased sebum production. One of the main causes of acne is incorrect and/or erratic eating habits and patterns. Consuming foods which are extremely rich in starch, artificial sugar, and fats only aggravates the condition. Chronic constipation is cited as another reason for the incidence of Acne Vulgaris. It is important that waste matter is regularly eliminated from the body, as a failure to do so would result in the circulation of toxins in the bloodstream. This may cause a host of other problems to surface in addition to acne. Devitalized skin, that is skin which has a parched appearance, could also lead to acne. Excessive smoking, insufficient production of sebum, exposure to extreme weather conditions, ill health, and excessive perspiration are some of the most common causes of devitalized skin. Quit smoking, or at least drastically reduce the number of cigarettes you smoke per day. Without this, no amount of home remedies for pimples or acne can help. In addition to being healthy for your skin, this will also help to increase overall health levels. You should also reduce your intake of all caffeinated beverages and substitute them with healthier options like fruit juices and fresh milkshakes. Make sure that you exercise on a daily basis and avoid sitting down for prolonged periods. If you have a sedentary job, make sure that you get up every hour or so and walk around for a few minutes as this will help to promote proper blood circulation. There are various natural home remedies for the treatment of teenage acne as well as adult acne. Vitamin A and Niacin seem to be effective in the treatment of acne. There is no “best medication” when it comes to treating this condition because each individual reacts differently to acne treatment. However, homeopathic medication and blue light therapy can be tried in order to get rid of face scars and scars from the back and chest. Vitamin therapy should comprise the intake of 100 mg niacin, three times daily, and 50,000 international units of vitamin A, three times daily. Vitamin E, 400 mg, should be taken once daily. Continue this therapy for a month. You may also increase your intake of foods that are rich in these vitamins. Foods like spinach and kale are good sources of Niacin and should be included in your daily meal if possible. Other sources of niacin include asparagus broccoli, celery, and mushrooms. One of the simplest ways to include these vegetables in your diet is to prepare a salad using these ingredients. You can also add strips of lean white meat to your salad as white meat too is a source of niacin. Liver, carrots, sweet potatoes, and cantaloupe are all good sources of Vitamin A and should also be included in your diet. A simple way to include liver in your diet is to blend a small amount of liver along with a dash of lemon, pepper, and olive oil and use this mixture as a sandwich spread. Zinc seems to be the latest arrival in terms of the treatment for acne. Its results seem promising; however, individual reactions and responses to zinc acne treatment may differ. Zinc is available in tablet and in capsule form. In tablet form, it is available as Zinfet - 200 mg. The patient can take a quarter tablet so as to get 50 mg of zinc. In capsule form, zinc is available as Ulseal 220 mg. One-fourth of the powder inside the capsule can be taken as a single dose. The patient can take a dose of 50 mg daily upto one month or till there is noticeable improvement and then reduce the dose to 25 mg. It is important to consult your doctor before you decide to try any home remedies for pimples, or include any type of supplements in your diet. You can include foods that are rich in zinc in your daily diet to make sure that you meet your daily zinc requirement. Wheat germ, pine nuts, cashew nuts, and pecan nuts are all good sources of this mineral. A simple way to include these ingredients in your daily diet plan is to crush them together in a blender and sprinkle the resultant powder over your salads and other dishes. The crushed nuts will also help to add flavor to your food. Homemade Acne Treatment with orange peel has been found very effective. Pound the orange peel with water on a piece stone and apply on acne affected areas. Orange peels are mildly acidic in nature and help to cleanse the skin of excess sebum. You can make a face scrub out of gram flour and orange peels. This is often used as one of the most effective home remedies for pimples and acne. Dry a few pieces of orange peel and grind them lightly so that you get a coarse powder. Mix this powder with an equal amount of gram flour and then add enough water to this powder to make it a thin paste. You can use fresh carrot juice and tomato juice to the powder instead of water as carrot juice is rich in Vitamin A while tomato juice is mildly acidic in nature. Massage your face with this paste and then leave it on for five minutes before rinsing it off with lukewarm or cold water. A simple remedy at home for acne: Apply lemon juice regularly to reduce pimples and acne. This has proven beneficial results. Lemon juice is acidic in nature and also contains Vitamin C which is beneficial to overall skin health. If you have very sensitive skin, you can dilute the lemon juice with an equal amount of fresh mint leaf juice as this will help to reduce inflammation. This is also one of the popular home remedies for blackheads. Garlic has been used successfully to cure acne. Rub with raw garlic several times a day. Garlic is known to cure the toughest of acne problems. The external use of garlic helps to clear the skin of spots, pimples and boils. To cure acne further, eat three seeds of raw garlic once daily for a month. This purifies the blood stream and ensures basic cleansing of blood & keeps acne away. Garlic contains Allicin which is a natural antibiotic agent and this helps to prevent the spread of acne. If you have sensitive skin, you could add garlic juice to a spoon of yogurt and apply this mixture to your face. Yogurt contains several vitamins and healthy fatty acids and helps to moisturize your skin without making it oily. A teaspoon of coriander juice, mixed with a pinch of turmeric powder, is another effective home remedy for pimples and blackheads. Apply mixture on the face after thoroughly washing it every night before retiring. Use mint juice in a similar manner as coriander juice. Fenugreek is another useful remedy for acne. Make a paste of fenugreek leaves and apply over the face every night before going to bed. Wash off with warm water in the morning. This prevents pimples and blackheads. Grated cucumber applied over the face, eyes, and neck for fifteen to twenty minutes has been found effective. It is the best tonic for your complexion. Its regular use prevents pimples and blackheads. Mix a spoonful of fuller’s earth with a little apple cider vinegar and apply this paste to your face. Apple cider vinegar is acidic and helps to break down oils on the surface of your skin while fuller’s earth tends to absorb them. This reduces skin sebum levels and helps to treat acne. You should use an acne treatment face pack at least once a week to deep cleanse your skin and prevent the formation of acne pustules. To increase the effectiveness of this acne treatment you could steam your face before you apply the face pack. If you are pressed for time, you can have a hot shower instead of steaming your face as this too would help to temporarily open up your skin pores. To begin with, the patient should take only an 'all-fruit' diet for a week, taking three meals a day, of fresh juicy fruits, such as apples, pears, grapes, grapefruit, pineapples, and peaches. Only unsweetened lemon or plain water, either hot or cold, should be drunk and nothing else. After the one-week, all-fruit diet, the patient can gradually adopt a well-balanced diet with emphasis on raw foods, especially fresh fruit and vegetables, sprouted seeds, raw nuts, and wholegrain cereals, particularly millet and brown rice. Further short periods of the 'all-fruit' diet for three days or so may be necessary at a monthly interval till the skin's condition improves. Meats, sugar, strong tea or coffee, condiments, pickles, soft drinks, candies, ice cream, refined and processed foods should be avoided as far as possible. During the initial one week 'all-fruit' diet, a warm-water enema taken daily cleanses the bowels. Apply hot fomentation locally to open up the pores and to bring out the waste matter. Then rinse the affected parts with cold water. A hot Epsom salts bath twice a week is beneficial in all cases of acne. This bath is prepared by adding 1 ½ kg of Epsom salts to 60 litres of water having a temperature of about 37.8° C. The patient should remain in the bath tub for 25-35 minutes till he sweats freely. After the bath, the patient should cool off gradually. If your skin condition gets worse it would be necessary to consult a doctor for the same. Your doctor may prescribe some medicines that would be helpful for treating acne on oily skin. One should remember that there is no overnight acne cure for acne marks on acne prone as also on oily skin. Glowing skin for men and women that is free from acne scars could be achieved, but would require steady and continuous effort.